Born oceans apart, my grandparents fell into a story that starts with “once upon a time”. But before we go there, we need to understand something about a huge trip and a leap of faith. The thing about traveling is it forces change upon you whether you’re ready or not. You’re in a new place with new people and in this case, a completely new culture. Your languages don’t match and the basics of every day living are different, like the way the bread and water tastes. Leaving your comfort zone doesn’t begin to describe it. You aren’t used to the way people say hello to each other or the laws you are now abiding. You can’t put your finger on why the food tastes different or why the weather is just a little more dramatic then you’re used to. This is the beauty that comes with traveling, especially to a place you’re staying for a few weeks or more. As I experience this town for the first time, I realize this is how my opa (grandpa) must have felt when he first came here back in 1958 as part of the U.S. Army. When I first explored this town, I was shown the army base my opa was sent to. I saw the barracks he lived in and the mess hall where he stuffed his face. I stared through a locked gate at the overgrown roads and crumbling structures that had such a huge impact on my family. I saw the building my oma (grandma), her sister and niece worked in and imagined the blacktop filled with busy feet marching and cultures clashing. 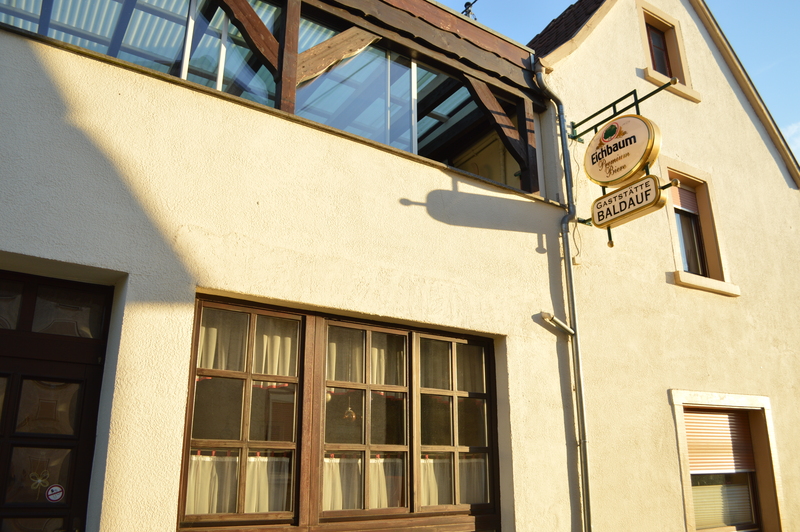 As I walked through the small town of Kriegsfeld, I stared at the restaurant where my oma and opa had their first date. I studied the coat rack where my oma had sent a little boy to retrieve her coat after ditching my opa at the dining table. I laughed at the idea that these two young kids had no idea the family they would create. The restaurant where it all began. It became so beautiful, to see these places for myself and hear their love story again. My oma, who barely spoke English, fell for the American army boy who barely spoke German. We drove the 10 Kilometers it took to get from the base to this small town and my opa would poke fun at the killer hills and swerving paths he took to walk all this way to see my oma. It wasn’t uncommon for the army boys to fall in love with the women in this town, he told me. Somehow, the language barrier didn’t stop these two from falling for each other. Through late curfews and stolen motorcycle rides (my oma was driving) their love story began to unfold as two best friends that were in love. I asked my oma what language she first said “I love you” to my opa and she responded with “German, but he didn’t understand what I was saying so it didn’t even matter.” Somehow, she must have got the message across because they’ve been married for 55 years now. 55 years is a remarkable time to be in love, I thought as I walked past the parking lot that used to be my oma’s home. This is the place she was born as well as where my aunt was born. She reminded me of how terrified she was to move to the United States where everything was so different from home. But she did it anyways. She said she lost so much weight from the ups and downs of her first year in America. She got her citizenship in a year in a half instead of the five years it usually took. She was scared in this new place that was her home and as she tells me this in completely perfect English, I realize that this woman is one of the bravest people I have ever met. My oma had love and that was it. The love for her husband and their new daughter gave her the strength to leave her home and everything she ever knew. She learned English by listening and became more aware of United States history than a native citizen. She made friends with a babysitter and local librarian who would help her learn as much as possible so she could become an American. This is just small evidence of the courage she has. Every other year, she would fly back to this small town to reconnect with her family and friends and she’s been doing this for over 50 years now. And now, I’m finally with her. I get to see every place she enjoyed as a teenager and enjoy them with the grandchildren of her friends. 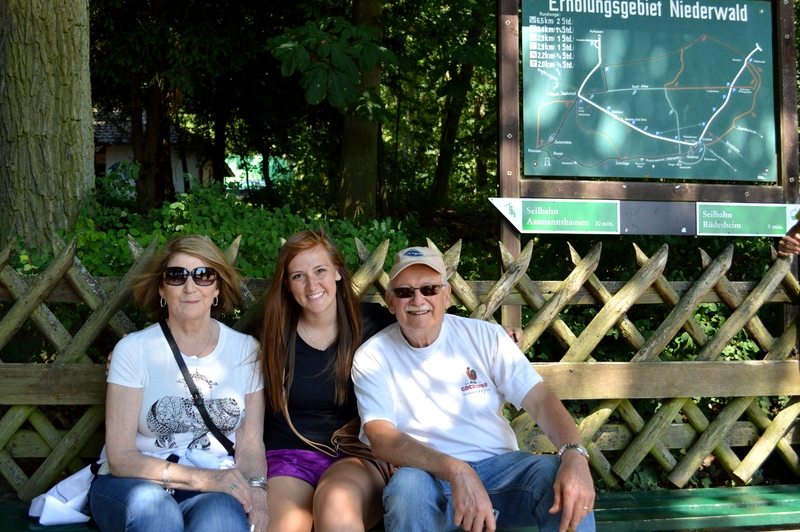 I get to meet my dad’s friends from his trips to Germany and make new friends of my own. The history this town holds in my family is truly incredible and inspiring. The love story that unfolded in this town is one that I hope to be so blessed to find one day. A love that you would literally cross oceans for.